The United States will take on Germany in their last Group Stage World Cup match on Thursday, June 26. That’s the last day for Group Stage matches. Portugal and Ghana, the other two teams in Group G, will play on the same day. The U.S.-Germany match is scheduled to start at 12 p.m. EDT. Pre-game coverage will start at least 30 minutes beforehand. Both teams advance if the game ends in a draw. If one of the teams loses, then it risks not advancing. If one of the teams wins, then it advances. The game will be at Arena Pernambuco in Recife, Brazil. The U.S. had a 2-2 draw with Portugal on Sunday; Germany had a 2-2 draw with Ghana on Saturday. MANAUS, Brazil—With Cristiano Ronaldo on the field, a one-goal lead is never safe. The world player of the year rarely sparkled on a hot and humid night in the jungle, but his inch-perfect stoppage-time cross set up Varela for the equalizing goal Sunday in Portugal’s 2-2 draw against the United States at the World Cup. The Real Madrid winger, who has been playing despite a left knee injury, showed flashes of his best, but his impact was minimal until the final seconds of the match. He curled the ball in to a diving Varela, who headed past Tim Howard to give the Portuguese team a slim hope of advancing to the second round and deny the Americans instant advancement. The United States now has four points in Group G, the same as Germany. Both Portugal and Ghana have one point. The Americans will face Germany on Thursday in Recife, while Portugal takes on Ghana at the same time in Brasilia. Nani scored first for Portugal, shooting past a sprawling Howard in the fifth minute. 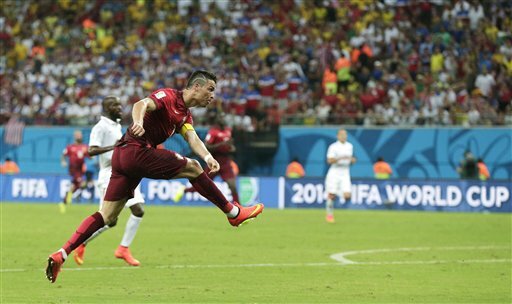 But the Americans responded in the second half as Portugal seemed to wilt in the stifling heat. Jermaine Jones made it 1-1 with a curling shot in the 64th after a cross from Graham Zusi made its way through the Portugal defense. And Dempsey, playing with a broken nose, then put the Americans ahead, using his stomach to direct the ball into the net from a cross by Zusi. Dempsey’s goal was his fourth at a World Cup and second at this year’s tournament. Jones scored his third goal for the United States national team and first in almost two years. It was all Portugal for much of the first half, with Ronaldo in the starting lineup but getting less involved as the match progressed. The Americans, however, started to get more and more chances and even had a shot from Michael Bradley cleared off the line by Ricardo Costa in the 55th. The heat in the Amazon rainforest, however, seemed to slow the Portuguese as the match wore on. In the 39th minute, referee Nestor Pitana on Argentina called for a cooling break, the first such decision to be taken at the World Cup. At the start of the match, FIFA listed the temperature at 30 degrees C (86 degrees F) with 66 percent humidity. FIFA uses the “Wet Bulb Globe Temperature” to determine when official cooling breaks should be added, and says the WGBT must be above 32 degrees C (90 degrees F) for them to be considered. The breaks are supposed to occur in the 30th and 75th minutes. There was no break in the second half, but that didn’t stop Ronaldo from creating the final goal.